66 Rutherglen Road corner of 62 Hospital Street, Gorbals, Glasgow. The Turf Bar, circa 1960s. This old Gorbals pub was around in 1875, one of the first licensee was spirit merchant called James Smith. The tenement building was owned by the Glasgow & South Western Railway Company. In 1893 James Ruthven Douglas was Licensee paying an annul rent of £88.00. Mr Douglas also ran a pub at 179 Trongate, City Centre, and lived with his family at 1 Albert Road, Crosshill, Glasgow. By 1902 James had moved house to 43 Queen Mary Avenue, Crosshill. The Trongate premises were gone, however he was running another pub at St. Enoch Square at the corner of Adam's Court Lane. Some may remember this old establishment as His Lordship's Larder. In 1904 John Griffin took over the business and continued until the end of the First World War. He also owned the Griffin Bar oat 244 Garscube Road. During the 1930s a lady was licensee, she was called Annie Henry. Charles F Cameron took over the pub in the 40s-50s. In 1958 James McKell took over this long established business. He became a well known and trusted figure in the Gorbals area for many years, and also with the Scottish Licensed Trade. 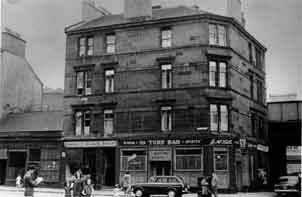 Mr James McKell occupied the premises until the late 1970s when the pub was finally demolished like all the other old pubs in the Gorbals. The last night at the Garryowen Bar, Norfolk Street, in the picture is Mr & Mrs Heraghty, D A MacLean (Phoenix); H Gallagher (Gallagher's Bar); J McKell (Turf Bar); S Falconer (The Matelot); E O'Doherty (Hampden Bar); P McGovern (Central Bar); J McCann (Mally Arms). 1972. This photograph was taken during the function of the Glasgow Licensed Trade Golf Club at the Grand Hotel, Charing Cross in 1966. After the dinner Mr A Hart announced his retirement as Secretary and was presented with presents. From the left row: Mr O A Douglas (Hepburn & Ross), Mrs J McKell (Turf Bar), Mrs J Morrison, Mr W Morrison (J E Mather & Son Ltd), Mrs G Falconer and Mr D MacGregor (Hepburn & Ross. 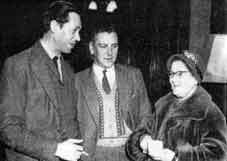 Right row: Mrs D MacGregor, Mr James McKell (Turf Bar), Mrs J Hutchson, Mrs O A Douglas and Mr J M Hutchison (Hepburn & Ross). Mrs & Mr James McKell. 1962. See other pubs on Rutherglen Road. Click here.